Here you can find recordings of webinars that were presented by Dynamic Design Solutions and FEMtools Solutions Partners on how to use FEMtools and on technologies that are included in FEMtools. In this webinar we focus on modal test planning and FE-test correlation analysis. You will learn what correlation analysis is, which techniques and metrics are available and how this fits within the FE model updating process. It will also be explained how a baseline finite element model can be used to prepare a physical modal test. This step is necessary to ensure that the test data will be adequate to serve as reference data to validate and update the finite element model. The presentation is complemented by a number of short demonstrations in FEMtools Pretest and Correlation. At the end of the webinar, time is reserved for questions and answers. In this webinar we focus on the model updating process that makes use of experimental reference data to calibrate the input parameters of a finite element model. You will learn about the different types of model updating and their relation to the selection of updating targets (responses). The selection of updating parameters is also a critical step and decision-making using background information, correlation analysis, sensitivity analysis, and exploratory model updating will be discussed. The presentation is complemented by a number of short demonstrations in FEMtools Model Updating to illustrate the different steps of the updating process. At the end of the webinar, time is reserved for questions and answers about FEMtools Model Updating and the methods that are used. Modal Based Assembly (MBA) is a dynamic substructuring method to predict the impact of a structural modification on the modal parameters of a structure and was first introduced in FEMtools 3.7. MBA is an extension of Structural Dynamics Modification (SDM) that replaces the SDM tool that was included in previous FEMtools versions. In addition to the modification elements that are used in SDM, MBA supports coupling of FEM substructures, test-based substructures or a combination of both (Hybrid Modeling). In this webinar we show how FEMtools users can get started with scripting and benefit from it. The FEMtools Script language elements and functions libraries (API) will be reviewed and a number of practical examples will be shown to illustrate the potential uses of scripts in different application scenarios. At the end of the webinar, time is reserved for questions and answers about FEMtools. 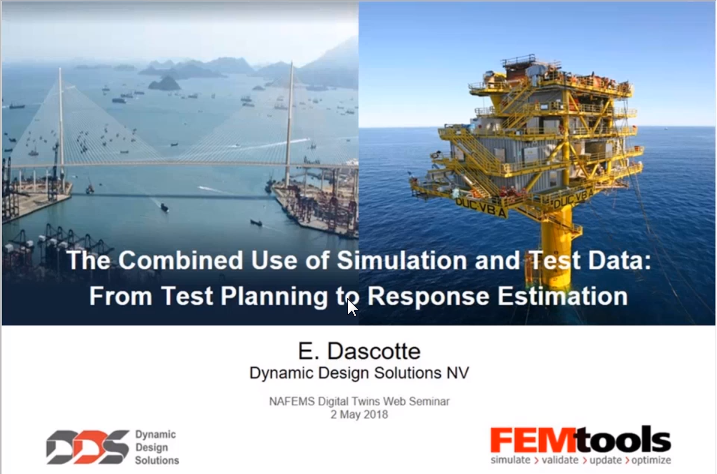 On May 2, 2018, Dynamic Design Solutions participated in a free eSeminar organized by NAFEMS, called "The Hype: Simulation & Digital Twins, Behind the Buzzwords". The eSeminar brought together the major software vendors in a uniquely neutral platform, to discuss their definitions of Digital Twin, some of the work they are doing in the space, and the barriers standing in the way of full adoption. The presentation made by Dynamic Design Solutions highlighted the important role that simulation models like FE models play in Digital Twin technology but also that validation and updating of those models is essential, from the prototype phase through the entire service life of a product. FEMtools is the perfect tool for this purpose, thanks to its interfaces with FE and test data, its unique blend of database and analysis tools, framework architecture and scripting capabilities. For information on our courses, click here. To be informed about our future webinars and courses, register here.